It is with profound sadness that we inform you all that Omana Micheal Maliakal(61), wife of M.K. Micheal, passed away in Neendoor. Funeral services will be held on Monday(10/06/14) at 3.00 PM @ St. Micheal's Church, Neendoor. She is survived by her husband,M.K Micheal; children, Sinaj & Liz Maliakal(KCS members), Smitha & Alvin Karathuruthel, Neethu & Mathew Makil and Chinu & Sebastian Anathanam. Chicago KCS extends her heartfelt condolences to surviving family members. Chicago KCS informs you all with deepest sorrow the passing away of Thomaskutty Kaduthodil, (former KCS member), husband of Sobhana (Kannampadathil, Chunkom). He died of heart-attack in Indianapolis on June 3rd at 4.30 pm. KCS extends heartfelt condolences to surviving family members. survived by her husband Saibu Elakkatt and four children. KCS Chicago extends its heartfelt condolences to surviving family members, Elakkatt family & Koonthamattathil family. Susamma Thomas Elackatt(76), who started for the first time Malayalam classes at Community center for the kids in Chicago Knanaya community, died at Carithas Hospital. She was preceded in death by her husband, Thomas Elackatt, few years back in Chicago. There will be no wake service. Sheena and Zachariah Nellickal (Ranny, Kerala). Neha, Joel, Festina, Toby, Hanna, Riya, Eva, Nethan, Siya, Raima, Rachel and Steven. It is with profound sadness that Chicago KCS informs you that Joy Chottuvelil, who was in the forefront for all the activities of Chicago KCS since its inception, died today morning at Lutheran General Hospital in Park Ridge. There is no doubt that KCS lost one of its dearest sons. He served as the KCS executive member two times(85-86 and 88-90) and was a former national council member. He was in the forefront for the all the activities of KCS since its inception. We will miss a warm-hearted gentleman. We will miss a loyal and dedicated community activist. We will miss his smiling face. KCS expresses its heartfelt condolences to surviving members and friends. Chicago KCS regrets to inform you that Mrs.Mariamma Joseph Idiyalil (91) passed away today in Chicago. Wake service will be held on Friday(1/17) at St. Mary's Knanaya Catholic Church in Morton Grove from 3.00 PM to 9.00 PM. Funeral Mass will be held at 9.30 AM on Saturday at St. Mary's Knanaya Catholic Church. Burial services will be held at Knanaya cemetery in Morton Grove followed by the funeral. Chicago KCS extends its heartfelt condolences to surviving family members. It is with profound sadness that KCS informs our members that Biju Thuruthiyil (45), KCS National Council member, died in Chicago today early morning. He is survived by his wife, Lisamma and daughter,Cicilia. He is originally from Karippadam (Bramamangalaam) Parish. KCS Chicago extends its heartfelt condolences to surviving family members. Wife: Laizamma from Kalapurackal Karottu belongs to Neerikattu parish. Only daughter Cecilia is 7 years old. We, the members of KCCCF, with deep sorrow convey our heartfelt condolences to Thuruthiyil family for the untimely death of their beloved Biju. We pray that his soul may rest in peace and may Almighty God give strength to his family, specially his wife and daughter in this time of grief. On behalf of KCCNA, we are deeply shocked and saddened to hear of the untimely death of Mr. Biju Thuruthiyil. As one of Chicago’s national council members, we were very fortunate to have interacted with Biju. We warmly remember his enthusiastic and skillful support to be the accommodation chairman at the next KCCNA convention. We have lost a great man who cannot be adequately replaced but suffice it to say that his highly productive and inspiring life is a great legacy that will make his memory very fresh and indelible in the minds of all of us. Each of us not only grieves at the passing of a tremendous individual but also for the loss his family. We would like to extend out our sincerest condolences to his wife Lisamma, daughter Cicilia, and the rest of his sorrowing family and community in Chicago. On behalf of St.Mary's Knanaya Catholic Parish Executive we would like to express our Heartfelt Condolence to Thuruthiyil Family. On behalf of the Houston Knanaya Community, we the executive committee would like to express our sincere condolences to the Thuruthiyil family and the whole Chicago Knanaya Community. We are deeply saddened by the untimely death of Mr. Biju, a wonderful young man and a National Council Member. Our thoughts and prayers are with Biju's family. May God give them the strength and will to stay strong during this difficult time. KCS held a memorial meeting on 6/23/13(Sunday) at community center in memory of Biju Thuruthiyil who was a KCCNA national council member from Chicago. He died few days ago in Chicago leaving a big void in Chicago Community. KCCNA leaders, KCS leaders and members, friends and families of Biju Thuruthiyil,who gathered at community center, shared their memories of him during meeting. It is with profound sadness that KCS Chicago announces the sad demise of Mr.David Peter Elakatt. He was 22 years of age. He is the Son of Peter and Mary Elakatt. He passed away this morning (May 27th, 2013). Chicago Knanaya community expresses its heart felt condolences to the Elakatt family in their profound loss. It is with profound sadness that KCS Chicago announces the sad demise of George (Korakutty) Padinjarel (76) at Chicago today (Feb 8th 2013) morning. Chicago KCS extends its heartfelt condolences to the surviving family members. It is with profound sadness that KCS Chicago announces death of Joseph Kanjirathumkal (84) who passed away Tuesday, January 22, 2013 peacefully at his home in Burr Ridge, Illinois. Joseph (Pachy) is originally from Monippaly, Kerala. Joseph moved to Kottayam in 1959 and later migrated to USA in 1979. It is with profound sadness we inform the passing away of Mr Stephen Puthenpurayil (Esthappan), age 77 - Monippally - Nephew of Late Rev. Msgr. Cyriac Mattathil. He is survived by his wife, Mani, Kanjirathumkal family; his children, Shirley (Detroit), Shyla (Las Vegas), Jose (Las Vegas), Sheeba (Chicago), and Cyril (Detroit);in-laws, Thankachen Vanchithanam, Martin Manumkal, Alphonsa Muttam, Sabu Mutholath, Josena Puthiyadathusseril; grand Children, Ashley, Alisha, Justin, Jessica, Albin, Alex, Anjali, Christopher, Marilyn. Wake service: Sunday, January 20th from 4:00 pm to 9:00 pm at Sacred Heart Knanaya Catholic Church. Burial Service: Monday, January 21st at 9:30 am at Sacred Heart Knanaya Catholic Church. Live broadcast service through Knanaya Voice. On behalf of Chicago KCS, executive committee extends its heartfelt condolences to sorrowing family members. It is with profound sadness that we announce the passing away of our beloved Mrs. Thresiamma Thomas Thandanolickal (Cherukara) of Areekkara, on Thursday July 26, 2012 in Chicago at the young age of 53. She is survived by her husband Mr. Thomas Mathai, and son Telson Thomas. She hails from Mutholath family, Cherpunkal. When:- Sunday, July 29th, 2012 from 5:00PM to 8:30PM, Prayers to begin at 8:00pm. Wake Service : Sunday June 17, from 3:00 P.M. - 9:00 P.M.
at St. Mary's Knanaya Catholic Parish, 7800 W. Lyons St., Morton Grove, IL, 60053. Funeral Service : Monday June 18th at 10:00 A.M.
at St. Marys Knanaya Catholic Parish, 7800 W. Lyons St. Morton Grove, IL. 60053. Burial Service will follow immediately after the Church services at St. Mary's Knanaya Catholic Cemetery (Mary Hill Catholic Cemetery, 8600 Milwaukee Ave. Niles, IL 60714). Chicago KCS express our deepest condolences to Idiyalil and Karikkal families and all other relatives and friends of Sally Aunty. This is to inform you that Thomas Chilampathu (62) passed away today (6/7/20012), He was the beloved husband of Annamma Thomas (Kaniyalil family, Punnathara Parish) and dear father to Mary Ann, Joseph and Liza. Wake Service : Friday June 8, from 3:00 P.M. - 9:00 P.M. at St. Mary's Knanaya Catholic Parish, 7800 W. Lyons St., Morton Grove, IL. Chicago KCS express our heartfelt condolence to Chilampathu and Kaniyalil families and all other relatives ad friends of Thomas Chilampathu. 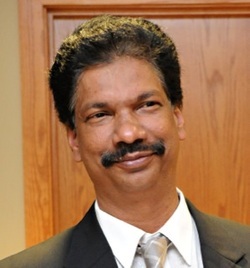 Our beloved, Jojo Mathew (Madhu Edayadyil) (Age 53) passed away onWednesday, May 30, 2012 at 05:00 AM. He was born in Karimkunnam, Kerala and lived in Woodstock, IL. He was born on April 3, 1959 to the late Joseph and thelate Aleyamma Edayadyil, He was the husband of Lissimol Jojo, and father of Joshua, Justin, and Genna Jojo. He was the brother of Jose, Augustine, Stanley, Stephen, Cisiliamma,and the late Sunny Edayadyil as well as Rosamma Karwal, Accamma Nicoli, Daisy Sebastian, and the late Leelamma Sebastian. The wake is going to be held at St. Mary's Knanaya Church in Morton Grove, IL (7800 W. Lyons St., Morton Grove, IL 60053) on Sunday, June 3, 2012 from 3PM until 9 PM. Funeral Services will be held at St. Mary's Catholic Church in Woodstock, IL ( 313 North Tryon Street, Woodstock, IL 60098) at 10:00 AM on Monday, June 4, 2012 with burial services to immediately follow. Chicago KCS express our sincere condolence to Edayadyil family. Let us pray for the departed soul. This site is managed by KCS Chicago. External links to other Internet sites should not be construed as an endorsement of the views or privacy policies of KCS Chicago.